My next How to Photograph Jewelry webinar will be at 2 pm EST this Sunday, April 17. There is still room if you wish to join me. Just email me at beadinggem.yahoo.ca. Or signup for the webinar notification email if a future date is more convenient. Please note I do re-book you for another webinar if life happens and you couldn't make it after paying for attendance. From now on, I am also offering a re-take of the webinar for $8. The webinar is not static - it is constantly updated to reflect technological changes and emerging trends. So if you took it last year, there have been notable changes since then. While I still cover how to use any kind of cameras, I have noticed many attendees now possess smartphones. This reflects what I said in this post about the rise of smartphones (for e.g. in the US it is 77% of the population, in Canada, 70%). And those percentages are still growing. One attendee actually said the reason why she was taking in the webinar was to learn the ways in which the smartphone could be used for selling online. Hence my continual addition of tips and tricks for mobile phone (or tablet) photography. Don't get me wrong. dSLRs do take fantastic photos - if you know how to use these cameras. But why buy one if you already carry a good camera around with you? The quality of smartphone cameras have improved so much so that it now makes sense to use them. Some dSLRs now come WIFI connectivity these days to transfer images to smartphones and tablets. Smartphones lets you access the internet in all the ways that matter, making your work flow easier and quicker. There are increasing numbers of photography apps - some of which I will cover in the webinar. All this so you can free up more time to do what you love most - making jewelry. While other craft selling sites can be accessed via the general smartphone browsers, Etsy does have its own apps which offer some advantages. 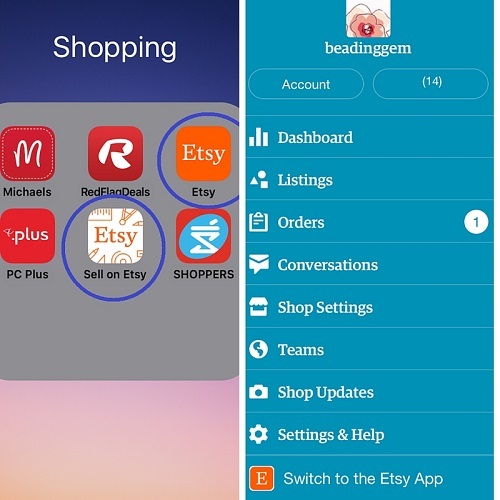 The first, Etsy (for iOS and Android) is the regular shopping app and the second, Sell on Etsy (iOS and Android) is specifically for sellers to manage their stores. Recently they introduced Shop Updates to their Sell on Etsy app. So I've tried it out. It seems like it is a way to update the people who favorite your store with news about your work. They don't call it a blog but it functions similar to one - a dynamic view of your store rather than a static site. The bonus feature is every photo you share is linked to the shop item with minimal effort. How convenient is this? Extremely. 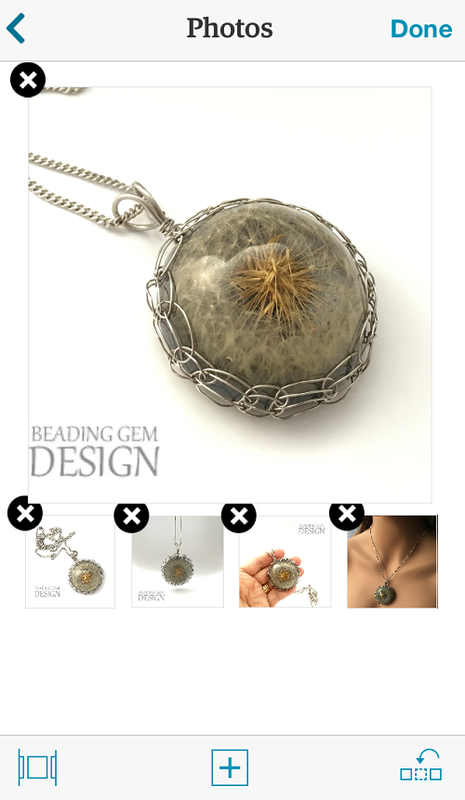 My latest design in the shop, a stainless steel wire wrapped resin cabochon pendant necklace was not only taken on my smartphone, it was quickly edited and watermarked. The first 4 pictures took me approximately 5 minutes. The mannequin picture took another 5 minutes because I couldn't get the "pose" and light right. Uploading to my Etsy via smartphone was a breeze. It really takes away the hassle of having to download to a computer and then uploading to Etsy - it is all too easy to procrastinate. All my photos are still on my smartphone - I will download them later to my computer simply for archiving. Backups are automatically done via iCloud and Dropbox. I used the Sell on Etsy app to share on social media. A neat tag is automatically added to the picture. Clicking on it takes the viewer directly to my Etsy listing. Smartphones make it so much easier to promote that I am sharing more on my poor forlorn Instagram (where you will also be treated to sneak peeks!). My webinar shows you how to improve your jewelry photography and much more! I'm always recommending your seminar to everyone Pearl. Why? Having taken it 3 times now I found that I learned something new every single time. Your entire seminar reflects your quality of presentation Pearl. Here are just some of the things I took note of during the seminar. 1. It is VERY professionally done. Not just something thrown together to share with others. You've obviously put a lot of time and effort into the entire seminar. 2. It is beautifully presented. Everything you show us draws your eye into the screen and you've chosen incredible images to illustrate your points. 4. You address problems and give concise solutions that even this gal could follow! 5. You take us step by step from beginning to end and you show us that yes it can be easy - after practice of course! 6. You answer the questions that come up during the seminar very thoroughly and share it with all who are participating so that we can all learn at once and again I thought - 'Yup - I was wondering that myself'. 7. You are extremely easy to talk to and because of that it makes this online course seem like we are with you in person and not with an automaton. 8. I enjoyed the seminar so much and learned so much that your offer of the repeat rate is a bonus because I think there is always something new to learn every day and that's a bargain. 9. I can't be the only one who leaves their brains and memory at the door (especially when I get all excited and wrapped up in what I'm doing) and so I of course forget little details - sometimes big details - so taking the seminar again is a great way to remind me. 10. Some of us want to take the seminar and yet haven't made the time or set up a place for taking the photos. A refresher with this seminar is exactly what I needed when I got around to actually photographing my work. Your seminar took away the fear and frustration when I set up my camera/phone. Thanks for offering this Pearl. I've truly learned an incredible amount from you. My head is stuffed with details and ideas! Thanks so much for taking the time to share your opinions! Much appreciated!! I also have a lot of fun interacting with readers from around the world!